Trump to the world – drop dead – is how Haaretz described the nixing of the Iran nuclear deal. And went on to compare Trump to Netanyahu – ‘both desperate to fend off metastasizing allegations of misconduct, zealous to make a mark in history, who resort to bigotry, misdirection, arrogance and kitsch.’ And suggesting that the Pompeo/Bolton hardliners’ tactics for effecting Death to the Islamic Republic could backfire, and badly. State of play at the moment is that the USA has been roped into Netanyahu and Saudi Bin Salman’s grand plan to behead the Iranian dragon in opposition to the EU, Russia, China et al. Russia has warned it may undermine the NK rapprochement since summarily ripping up an international agreement hardly inspires confidence when negotiating another. 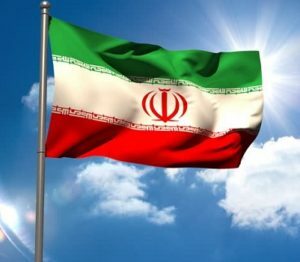 The USA has little trade with Iran even post the 2015 deal which lifted sanctions, but is threatening to punish others – EU, Germany particularly – who continue to invest in Iran. Still he got what he wanted – drama with him centre spotlight, causing chaos throwing spanners into the global works and giving Obama a bloody nose. And not a whiff of an inkling of a Plan B if it spirals the Middle East into yet more bloody chaos, which could impact Europe with another flow of refugees. Nor any understanding that it will only play into the hands of the hardliners in Iran. And if it leads to a boots-on-the-ground war between Israel and Iran, what happens to Trump’s America First policy? The Iran-backed anti-Israel Hezbollah has strengthened its position in the recent Lebanon elections. So Israel is at risk on two borders, there and in Syria. Relations between the EU and the USA and Germany and the USA are at a low this year and next, with a widening gulf in 2019. Netanyahu’s position looks precarious as the summer proceeds (see post 1 May). North Korea (post 27 April). On Iran (post 26 April) the only further thought I have is the chart of the Revolutionary Guard, who are the protectors of the Ayatollah and the Islamic Republic, and heavily involved in commerce as well as defence. 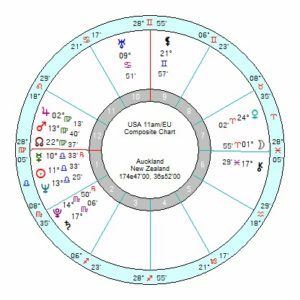 Founded 5 May 1979; they have a ruthless Mars in Aries opposition Pluto which is being heavily pressured by tr Pluto in square till late 2019, so their responses may be volatile. 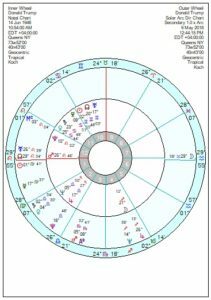 Donald Trump (I’ll do another detailed timeline tomorrow) – this may be his Solar Arc Uranus conjunct Mars moment – exact in a few weeks’ time but in effect now. It tends to overdo machismo, usually to prop up sagging self-esteem and often leads to wild misjudgments, which backfire. That’s especially true with a bombastic Mars in Leo. I’ve always thought if he was going to trip up it would be more into 2019/2020 when he has a raft of difficult Pluto transits to midpoints and a shockingly bad June 2019 to June 2020 Solar Return. Only final thought is Trump has a habit of rowing back on grandiose gestures, having made his splash, so the situation may evolve. I thought this was an Astrology site not a political forum ? So much depends on the 2018 elections. A Democratic House may not, by itself, be able to remove him from office (if the Senate is Republican), but at least the committees could do real investigations, instead of shilling for Trump. November can’t come soon enough. Great imagery, Les. Thank you for that. Exactly how I feel. Israel and Iran are now on the brink of war. Is mad Donald actually serving the best interests of the American people? It’s as though his first loyalty is to Tel Aviv and the headchoppers in Saudi. A shooting war with Iran will be catastrophic for many reasons not least the loss of life and the horrendous consequences for the world economy. He should be removed from office by patriots ASAP. He loves to kick over the cage…and spread gasoline over the it all. That ‘s how he runs the countery…and his past marriages. Living in the US during the time of Trump is like being in a car wreck every day. Could not have described how my household is feeling any better than you have. To live in America during these times. Headshaking with face-palm. Trump has also announced he is (and always was) more popular than Obama. Would the fall of Netanyahu kindle a fall with Trump’s base? And to force the EU via threat of tariffs and sanctions to stop business operations in Iran? Do Trump/Bolton et al really believe they can pull that off? It’s a mad hatter’s tea party. I feel like we’re all hostages on a madman’s bus careening down the highway as he throws garbage and grenades out the windows, the bus on autopilot but barely holding the road.